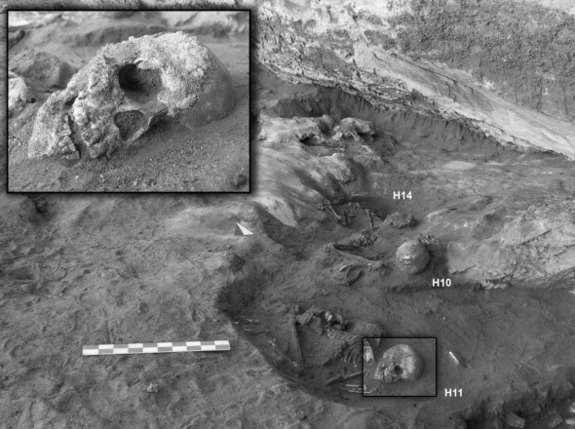 Archaeologists have uncovered 20 Stone-Age skeletons in and around a rock shelter in Libya's Sahara desert, according to a new study. The skeletons date between 8,000 and 4,200 years ago, meaning the burial place was used for millennia. "It must have been a place of memory," said study co-author Mary Anne Tafuri, an archaeologist at the University of Cambridge. "People throughout time have kept it, and they have buried their people, over and over, generation after generation." About 15 women and children were buried in the rock shelter, while five men and juveniles were buried under giant stone heaps called tumuli outside the shelter during a later period, when the region turned to desert. The findings, which are detailed in the March issue of the Journal of Anthropological Archaeology, suggest the culture changed with the climate. 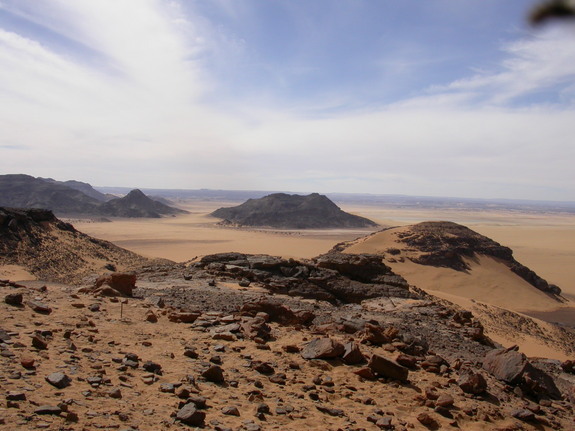 From about 8,000 to 6,000 years ago, the Sahara desert region, called Wadi Takarkori, was filled with scrubby vegetation and seasonal green patches. Stunning rock art depicts ancient herding animals, such as cows, which require much more water to graze than the current environment could support, Tafuri said. Tafuri and her colleague Savino di Lernia began excavating the archaeological site between 2003 and 2006. At the same site, archaeologists also uncovered huts, animal bones and pots with traces of the earliest fermented dairy products in Africa. To date the skeletons, Tafuri measured the remains for concentrations of isotopes, or molecules of the same element with different weights. The team concluded that the skeletons were buried over four millennia, with most of the remains in the rock shelter buried between 7,300 and 5,600 years ago. The males and juveniles under the stone heaps were buried starting 4,500 years ago, when the region became more arid. Rock art confirms the dry up, as the cave paintings began to depict goats, which need much less water to graze than cows, Tafuri said. The ancient people also grew up not far from the area where they were buried, based on a comparison of isotopes in tooth enamel, which forms early in childhood, with elements in the nearby environment. 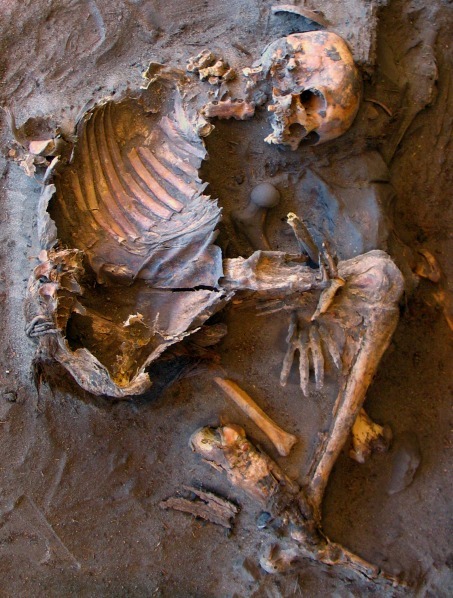 The findings suggest the burial place was used for millennia by the same group of people. It also revealed a divided society. "The exclusive use of the rock shelter for female and sub-adult burials points to a persistent division based on gender," wrote Marina Gallinaro, a researcher in African studies at Sapienza University of Rome, who was not involved in the study, in an email to LiveScience. One possibility is that during the earlier period, women had a more critical role in the society, and families may have even traced their descent through the female line. 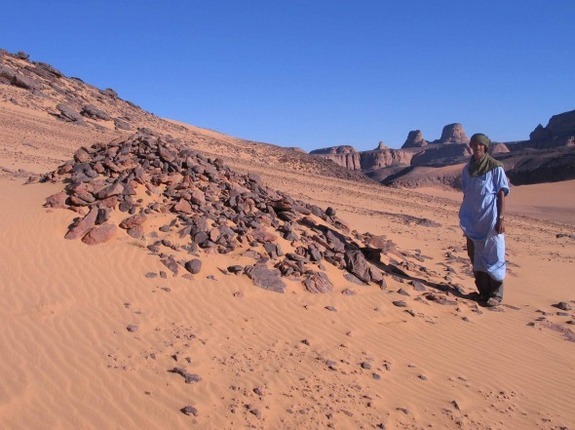 But once the Sahara began its inexorable expansion into the region about 5,000 years ago, the culture shifted and men's prominence may have risen as a result, Gallinaro wrote. The region as a whole is full of hundreds of sites yet to be excavated, said Luigi Boitani, a biologist at Sapienza University of Rome, who has worked on archaeological sites in the region but was not involved in the study. "The area is an untapped treasure," Boitani said.